Last Saturday morning at 7am our founder Paul Burgum set off on another of his endurance challenges. This time attempting to run the St Oswalds Way Ultra Marathon covering 100 miles, which he completed in a time of 26.53hrs. Paul also for the first time decided to try and raise some funds towards the Youth Music Programme, aiming to purchase a small amount of new equipment. We are extremely pleased to let you know that thanks to the kind donations from both our supporters and fellow runners on the day we have raised the total of £206.28. This money has meant that we have been able to purchase a new elctro acoustic bass for our bass player Ellie Liddle. As up till now this was the only instrument that we do not have any of our own. Paul Burgum said” I can’t thank everyone enough for supporting my run and even more importantly supporting the kids of the BCT Music group. I have known that Ellie has been working hard trying to save the funds herself to buy a acoustic bass, so she can play along with the acoustic guitarists without needing power. I’ve seen first hand her getting up early on a morning to complete her paper round to earn her own money and also how hard she works each week at BCT, even though she is the only bass player. This often means she has to be very patient whilst we sort the guitarists out first, before working on her parts. I think that her work ethic and her commitment to learning the instrument mean she is a great role model to other children within in the group and it seems fitting that my running hundred miles and working hard in the process means we can support Ellie in this manner”. 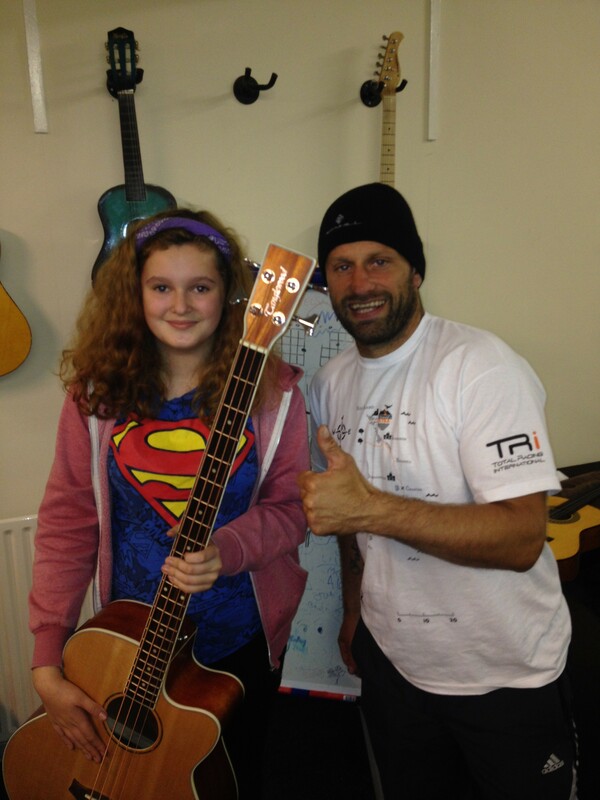 As part of the agreement with Paul for having the bass Ellie has to pay it forward by offering to teach other members of the group the instrument and sharing her own learning from the group. Paul further added ” I think this is as close to achieving my own dream for BCT as it comes, being able to help someone out who has shown all of the values and work ethic that i would like to think BCT stands for, even though we only raised a couple of hundred pounds, the value and effort that has gone in from all of us as team is very special to me and all the guys at BCT. The idea of having to pay it forward is something we use with the group a lot, with the older children supporting younger or newer members of the group, which helps build stronger friendships & teamwork. I reckon the look on Ellies face tells a story too, which is fantastic”. We would also like to thank Bandland music store in Stockton who are great supporters of our group and agreed to a significant discount to mean with have a got very good quality instrument for the money. The BCT Music group welcomes all children between the ages of 9-16 years old with our Music youth club taking place Thursday 5.30-7.30pm and Guitar lessons Saturday mornings 10-1pm. Please check out the relevant pages for more information.